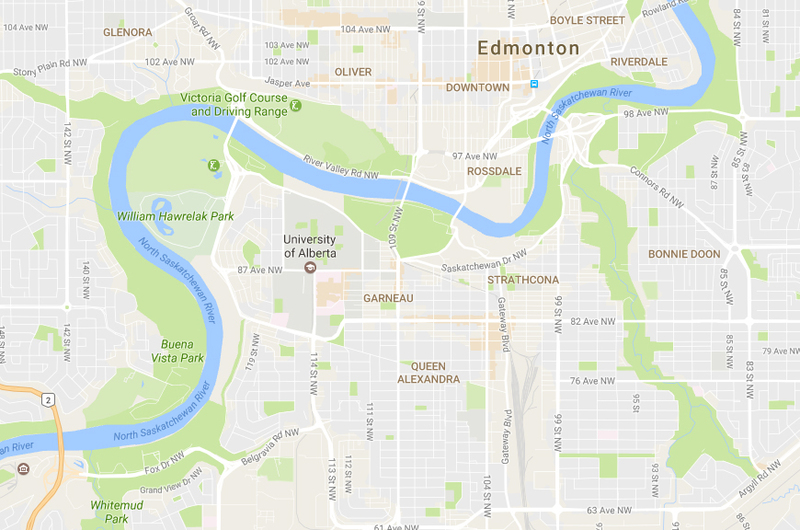 I’ve moved to Edmonton! The new centre of my universe is a neighbourhood called Strathcona. Edmonton is almost 300 km north of Calgary, so spring hadn’t quite sprung when I arrived in late April, though it was already springing in Calgary. The oppressive taupe of the leafless trees lacked visual appeal but the already green grass promised greener days ahead. And, indeed, a week later, the fresh green beginnings of leaves appeared in the treetops and the bright reds and yellows of tulips decorated the front yards of many charming Strathcona houses. My first birding destination was William Hawrelak Park. Deborah mentioned to me a while back that one of the silver linings of living in Edmonton was the possibility of seeing Cape May Warblers. A quick search on eBird revealed that these little beauties had previously been spotted at this park. No warblers visited me that day, May 2nd, but I did see a lot of waterfowl in the man-made pond. The gulls (Franklin’s and Ring-billed) were present in large numbers and were raising quite a ruckus (especially the Franklins’!). The Canada Geese were also quite plentiful and added a few honks to the gull cacophony. 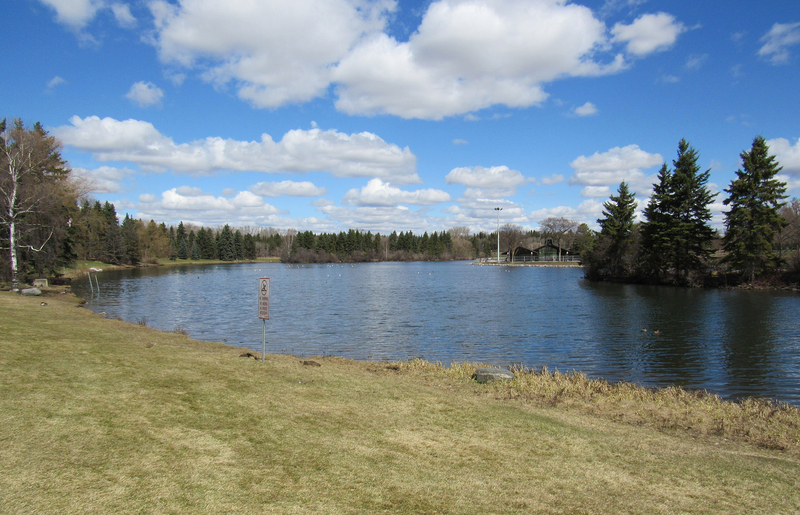 William Hawrelak Park pond from the south side looking north. 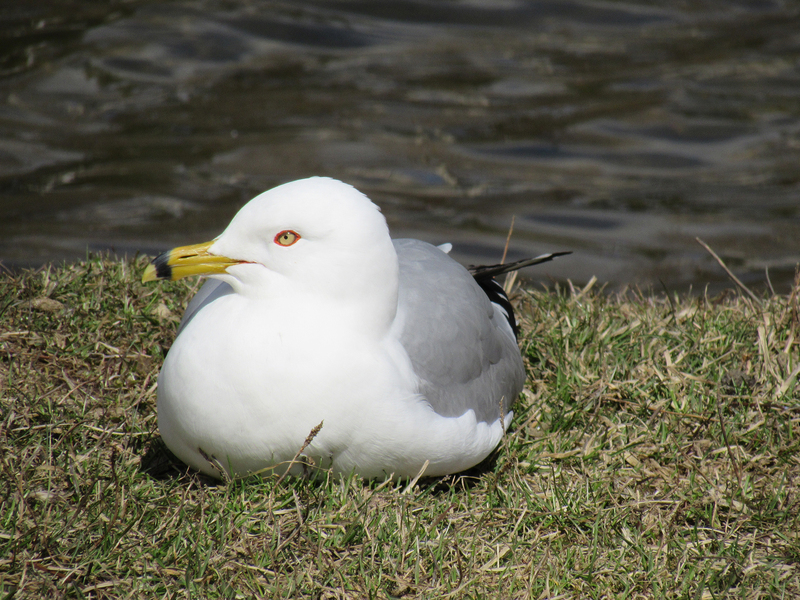 A Ring-billed Gull sitting on the south side grass. 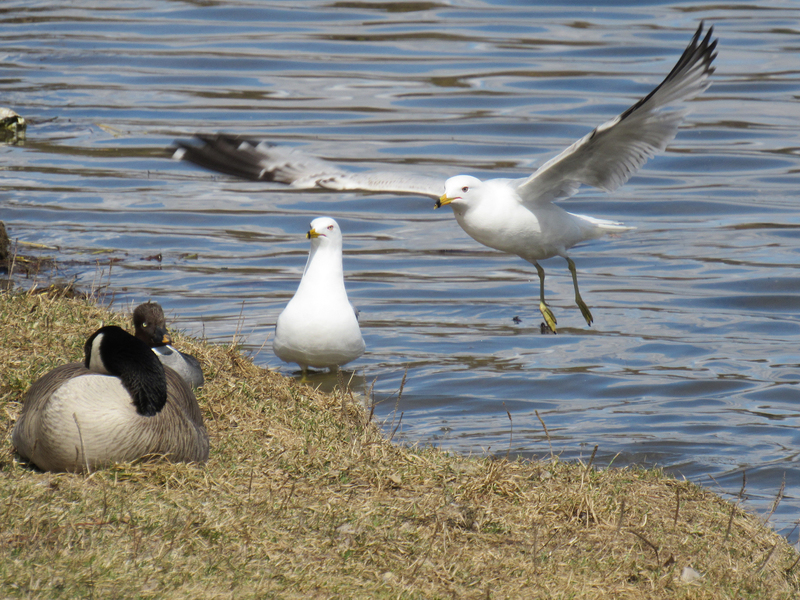 A Canada Goose, a female Common Goldeneye and two Ring-billed Gulls. 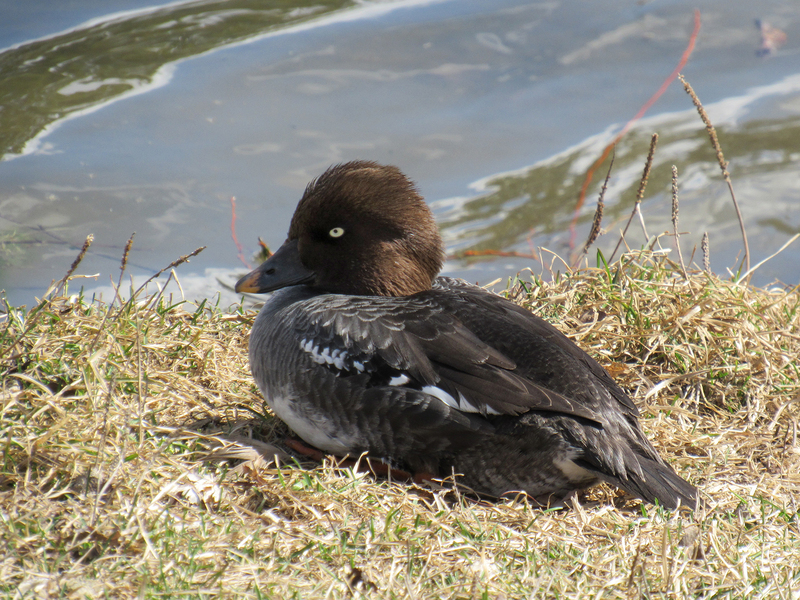 A female Common Goldeneye sitting on the south side grass. 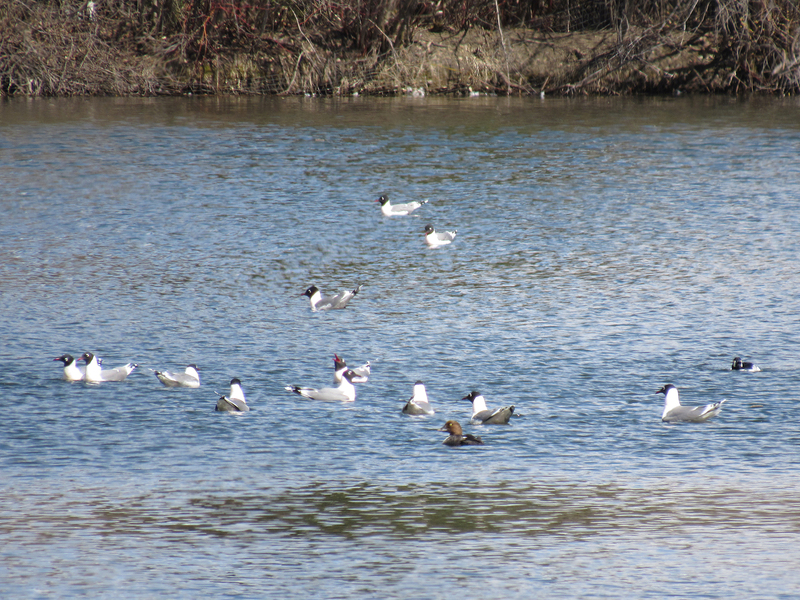 A small sampling of the many, many Franklin’s Gulls swimming on the pond. The non-gulls are a male and female Common Goldeneye. 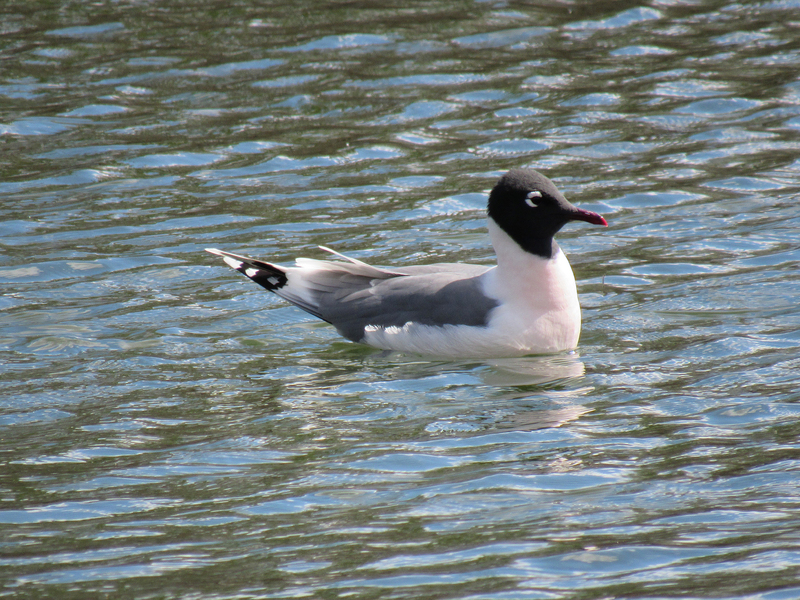 A closer view of a Franklin’s Gull. 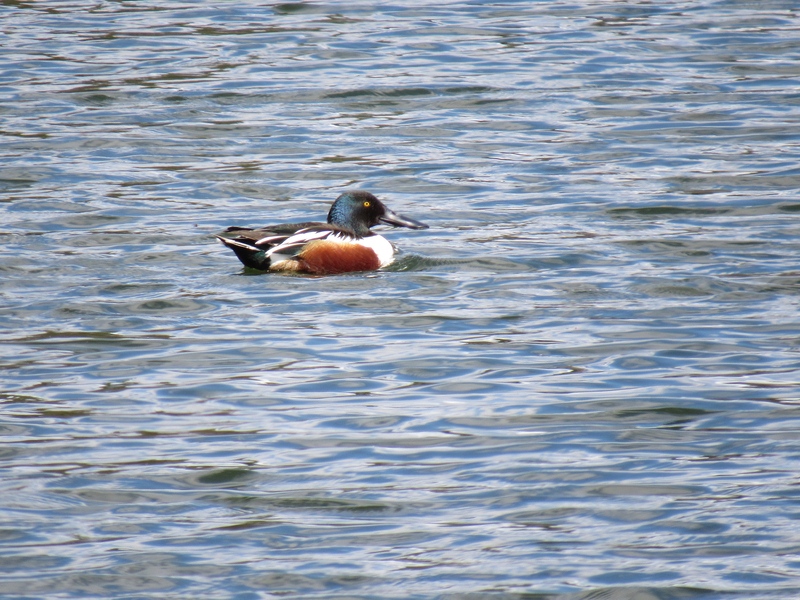 I spotted two male Northern Shovelers but no females. The pond has two little islands. 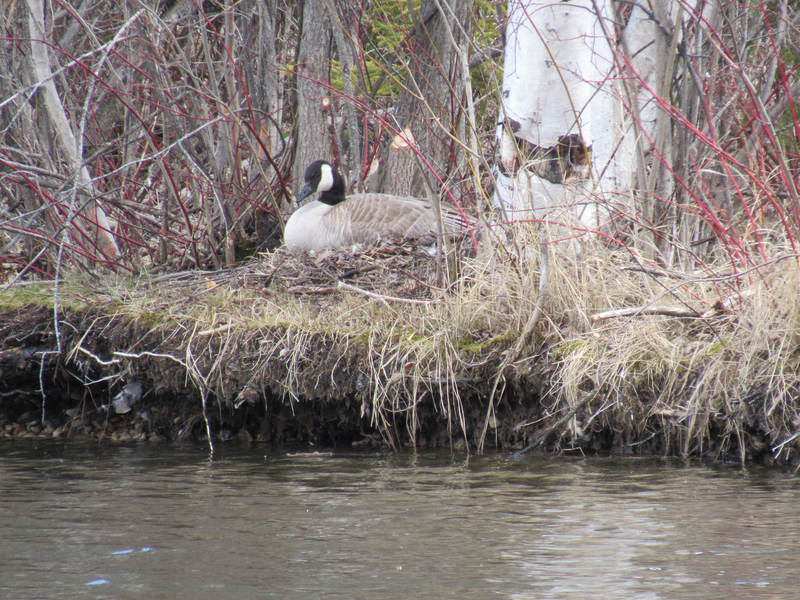 Each island had multiple Canada Goose nests on it. I’m curious to see how many goslings will be snacking on grass next time I visit the park. 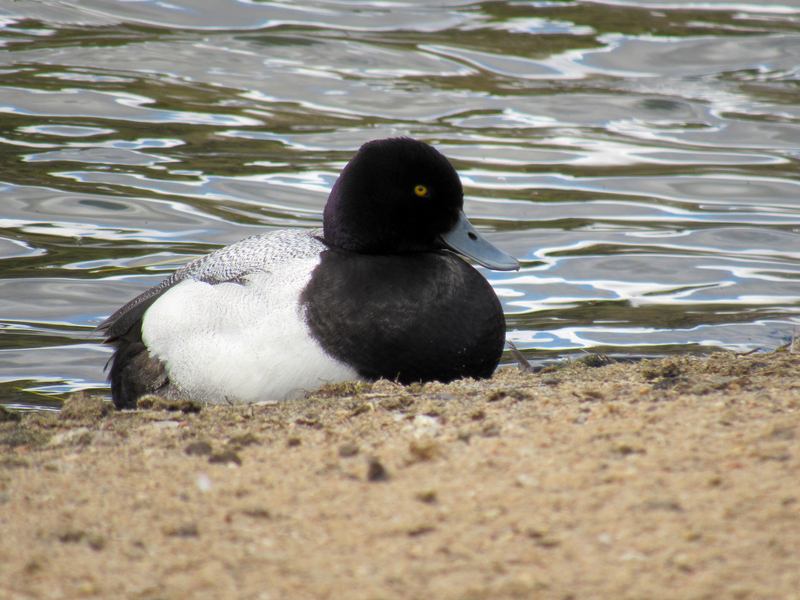 Male Lesser Scaup sitting on north side beach. I saw many Lesser Scaups, both male and female, on the pond. I am going to get to go to Canada this summer, and I am looking forward to seeing birds in their summer plumage, instead of the dull winter plumage we see here! I hope you get that Cape May! I vaguely recall reading about a park in Texas which is on a major bird migration route, where many warblers can be seen for a few days. I think the place was also mentioned in the movie The Big Year. The name escapes me at the moment. Do you happen to know of such a place? Probably Boy Scout Woods on High Island. It is only about 30 feet above sea level, but that lets the trees keep their roots out of the water and grow tall, so when the birds come across the Gulf of Mexico, it is the first place they see to land. They “fall out” there if a cold front is coming down, which is bad for them, but makes for good birding. That sounds like the place. Thanks for mentioning fall outs. I didn’t realize the place was more than a nice stop-over; it is essential in the spring when the birds are flying north, especially when the cold fronts you mentioned occur. Thanks, Hanna :-). The mountains and ocean are a bit far from this city and the winters are quite long, but there is a lot to like (and maybe love) about this city. You live quite far north too and know about long winters! I wore my winter coat one morning this week, but the afternoons are mostly warm now. Are you enjoying all the little plants that are popping up? The vegetation here is a bit different from Calgary, so I am trying to learn the names of a few new trees and other plants. Happy Spring! Congrats on your move. Must be beautiful there now at the end of May! Enjoy your outdoor excursions and exploration. So much fun in new places. Beautiful Scaup and Goldeneye. Thanks, Shannon :-). It is a bit ungrounding to move to a new home, but the process of getting to know the place is pretty exciting… so much is new and interesting. Thanks, Hazel :-). My husband and I were most worried about how our cat would react to the move and she adjusted surprisingly well. I think she likes our new apartment better! She and I are both enjoying watching new birds. I love your proclamation about the new center of the universe, being someone to whom place is very important. Your bird portraits are terrific – esp. the Ring-billed gull and the female Goldeneye. I hope you settle in nicely – Spring is a good time to get to know a place. Thanks, Lynn :-). I like your comment about the importance of place. I have been walking more than usual to get a feel for the places around me. I think I need that to connect to my surroundings. I find that your images always capture the sense of a place quite vividly (the “plant space” in particular) with the details you choose and how you frame them and that sense of time passing and growth and weather. I just hadn’t quite thought about your images that way before. I appreciate your sensitivity to the uniqueness of places :-). Interesting comment about westernization and homogeneity. It makes me think of McDonald’s. It is in most countries I’ve been to. They’re all similar but also distinctly different. I don’t approach subjects with a conscious thought of capturing a sense of place, but I think it’s just below the surface, always hovering around. It’s connected somehow to an appreciation of differences – i.e. how places are different. Uniqueness. Thanks for sharing your thoughts, because it helps me, too. And McD’s – well, I guess each one’s a bit different, but not the kind of differences I’m likely to pay much attention to! 😉 I totally avoid them, but a friend who went to Japan years ago said he was so relieved to have a burger at a McD’s in Tokyo after a lot of “strange” food. Haha :-D! I’d rather eat “strange” food than McD’s. Although cities around the world are being modernized and westernized in the clothes they wear and their technology usage, luckily, there are also many options for “strange” food. I mostly don’t go to McD’s now, but I loved it when I was a kid. And I travelled a lot with my parents so I experienced many cultural variations of them. Welcome! This is an awesome place! Great to hear thanks for the reply Myriam! It looks like you found a great park for birding, and getting in touch with nature. I love the Franklin’s Gulls, they’re so striking, and not as common as the Herring or Ring billed around here. I hope you love your new home, and city! Hope you will love it there. Best wishes. I love your new avatar. Looks like you have moved to a perfect place for bird watching. Thank you! 🙂 Well, I don’t know about perfect…. I could live closer to a big and wild wetland. But there are near-ish ones to explore. And nearby, there are always a few entertaining birds. I missed you too! Glad to hear you are good swamped, but hopefully you get to put your feet up soon. Thanks for the good moving wishes <3. I'm enjoying saying that I live the boreal forest! Thanks so much, Myriam! ❤ It's stalled again. I love the overall idea, but the nitty gritty of the details is dragging me down. Yeesh. LOL! Près de chez moi, dans les bois qui bordent la rivière et les ruisseaux, il y a beaucoup de Viréos aux yeux rouges et de Parulines jaunes. J’entendais le chant des mâles partout en Mai et Juin; c’était nouveau pour moi cela. Je voyage surtout en marchant ou par bus, donc pas encore de voyages très loin, mais il y a quelques zones humides (pas trop trop loin) que j’aimerais visiter avant la fin de l’été. Aussi il y aura la migration de différentes espèces de parulines à la fin Août! Les mouettes de Franklin ne sont pas restées pour l’été. Peut-être qu’elles feront escale à l’automne dans un plumage différent? Mes excuses pour mon retard à répondre. Je suis un peu en arrière avec le blogging cet été! Salut Myriam, pas de soucis pour ton retard, l’important est de profiter de la vraie vie, celle où l’on peut apprécier le chant des parulines et traquer nos amis ici et là 😉 Super pour les viréos, je les ai toujours raté jusqu’à présent en Amérique du Nord, faudra que je revienne pour eux et pour d’autres (les oiseaux me donnent toujours de super excuses ;)). Les parulines au Canada, c’est vraiment le top, tellement d’espèces et toutes si belles, un régal !